Status: offline Of my work in progress room. The first room is my former pink sewing room. It will be wallpapered. Status: offline Such anticipation! It looks like you will have fun placing all your treasures in the correct places. I am so relieved things are finally coming together for you, Lillian. Status: offline The area under the desk in the last picture is (grandson!) access to the storage space. The two big units at the right side are giant drawers that go almost all the way back. The drawers will be behind laminate covered doors, as my ironing board will go in front, and the laminate will be easy to clean. I get a lot of spray starch behind the ironing board. There are two smaller storage areas on the other side of the room, where the big dormer is...didn’t take a picture of this. They ordered the wrong laminate so they won’t be able to finish until it arrives and is installed on the door fronts. My new cutting table will have a matching laminate top. 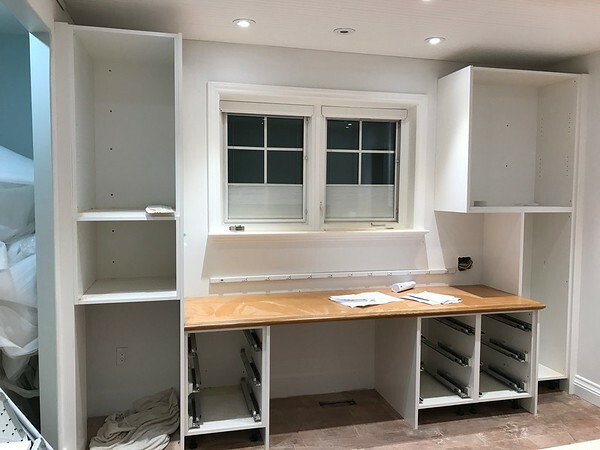 The rest of the cabinetry is painted white. Status: offline I am so excited for you, Lillian!!!! This wonderful!!! Status: offline WOW! Lillian, that is going to be so wonderful when it's finished. Status: offline Finally! 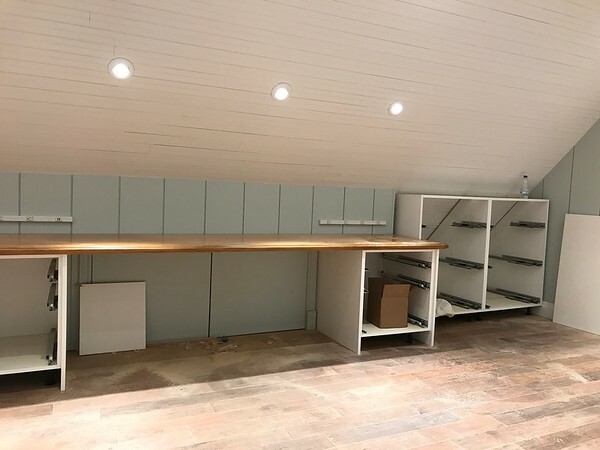 It looks just wonderful and so practical too, so relieved it's coming together for you at last. Status: offline Looking good! 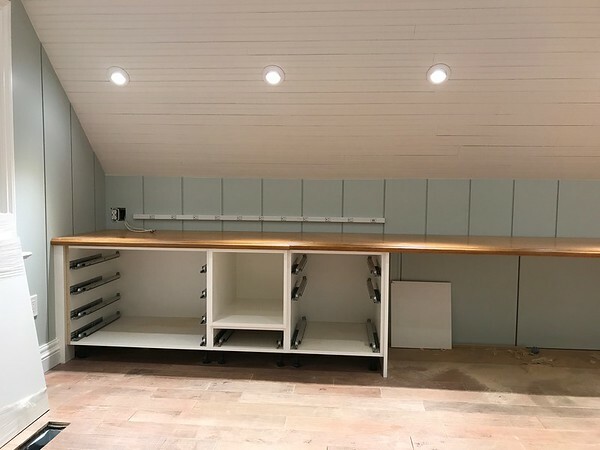 Your dream sewing space is beginning to take shape, at last. Status: offline Wow! Great space! Look forward to seeing the final results! Status: offline Lillian that is going to be one gorgeous sewing room. When do they estimate the rooms will be finished?? I bet you are ready for the work to be completed!! We re-did our bathroom. Two weeks turned into almost 8 weeks with a leak in the kitchen ceiling from some of the work the building did years ago. The plumber did not use glue on some of the water lines in the house! Status: offline Yay .... progress!!! Status: offline Well worth the wait! Now that we have a sneak preview, I'm anxious to see it when it is all done! Status: offline It looks fantastic!! I know you are anxious to be done...and I hope you can soon be settled in and back to stitching!! Status: offline Thanks for the fabulous update! I'm sooooo jealous & also so relieved that this is coming together for you AND in the foreseeable future. Status: offline OT--- just want to Wish Sassy and Marco a very happy anniversary. Also how is Paddy?? Status: offline Thanks for the update. You won't be able to contain yourself when you can actually use your new room! !